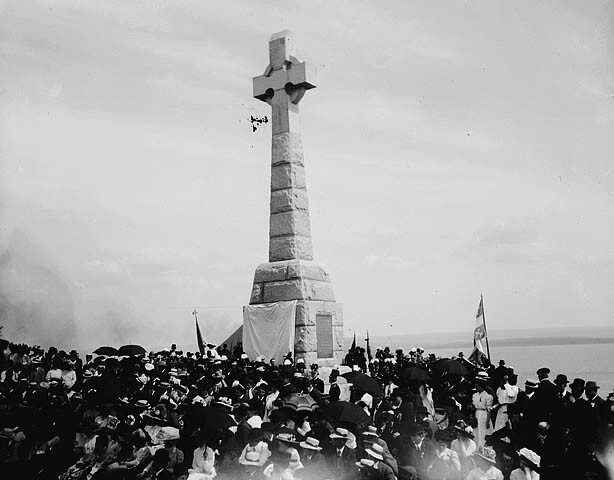 A 1909 monument erected in memory of the the death of Irish immigrants of 1849. Grosse-Île, Québec, Canada. Photo by Jules-Ernest Livernois. On the tenth of May, 1832, my parents with their eight children sailed from Ireland to America; and, although the other passengers fared very well, and notwithstanding I was a perfectly healthy Irish girl of sixteen, during the whole voyage of one month, I was ill….We were much relieved to be landed in Quebec but imagine our feelings at finding ourselves in a plague-stricken city; where men, women and children, smitten by cholera, dropped in the streets to die in agony, where business was paralyzed, and naught prevailed but sorrow mingled with dread and gloom.…people passed us, each holding, between their teeth, a piece of a stick, or cane about the length of a hand, and as thick as the stem of a clay tobacco pipe, on the end of which was stuck a piece of smoking tar. We learned this was used as a preventative. I was now in a veritable house of torture, where the most appalling shrieks, groans, prayers and curses filled the air continually. As if in answer to this, day and night, from the sheds outside came the tap, tap, tap of the workmens’ hammers, as they drove the nails into the rough coffins, which could not be put together hastily enough for the many whose shrieks subsided into moans which gradually died away into silence not to be broken. Whose poor bodies were then carried to the dead-house in the hospital yard, confined, piled on the dead cart and hurried off to what was called the cholera burying ground; where, so great was the mortality at the time, corpses were buried five and six deep with layers of lime between, in one grave. All the medical men’s efforts to save were futile, until I fell into their hands. And as I slowly, but surely, recovered such interest was centered on my case that four doctors, at a time would stand bending over me, noting anxiously, each symptom of returning health. In spite of their watchfulness, however, I twice managed to disobey orders. On a long table in the ward in crocks each with a little dipper beside it stood the drinks allowed us – brandy and water, lemon juice and water without sugar and very thin gruel without salt, but none of these satisfied me, for my bed was near the window, through which could be seen a well and this set me dreaming often with tear-filled eyes of mother’s well far away, over whose low brim some big old country roses drooped, seeming to impart their fragrance to the limpid deliciousness beneath. And I craved incessantly for one drink of clear cold water. Finally my pleadings touched her so that she brought me a small cup of water, which I drank greedily. It had no bad effect whatever and the doctors in spite of all their watchfulness detected nothing unusual. A little later, enlisting the sympathies of the nurse, who had helped in my former venture in what I persuaded her was a good cause she bound me to secrecy and smuggled in a cupful of warm broth, which I swallowed and in a few hours was once more on the verge of the grave. As mine was the case on which the doctors’ hopes hung, this relapse caused them much distress: the head physician declaring, angrily that some one had tampered with me; but ill as I was all efforts to make me divulge were useless: and the nurse a big, jolly Irishwoman, declared when we were alone that I was a ‘little brick’ and that she was proud of her countrywomen. My disobedience very nearly cost me my life, but a good constitution triumphed and six weeks from the time of entering the hospital I was sent to the recovery sheds adjoining where sad to say, some, who were cured of cholera contracted small-pox and returned to the hospital and died. While in the recovery sheds we were allowed daily, the juice of six lemons and a handful of peppermints. My father brought me a fresh supply of both each morning and at the end of a week was told he might take me away. As I walked for the last time in the hospital yard, I saw, burning there, cholera-tainted rich velvet and silk gowns, costly bonnets and shawls, children’s clothing the rags of the poor, gorgeous uniforms, boots with spurs attached and all else which formed a pile almost as high as an ordinary house. As I watched the flames creep upward, I realized that, before me was indeed a shocking proof of the ravages of the plague. And breathing a prayer for the souls of the dead, who had once worn those garments, I took my father’s arm and set out, all sadness giving way to the joyful anticipation of a family reunion, not knowing that my own sisters’ and brothers’ clothes were in that burning pile I had left behind, until I met my Mother, dressed in deep mourning, her pretty face sad and care-worn when she told me I was the only one of her four sick children who had survived. What did Mary overcome on her journey to Ottawa? What was the impact of the journey on Mary and her family? What does this letter reveal about the health conditions on the ships from Ireland? What do we know about how Mary recovered from her illness? Who were the people who helped her recover?